I occasionally hear praise for the Tarte matte eyeshadow palettes but for the most part, when I think of Tarte, I think of their much lauded blush line. I only have one shade and I just freaking realized when I sat down to write this post that this shade has been discontinued. I purchased this in the not too distant past, so maybe it’s still available in stores, but it is nowhere to be found on Sephora, Ulta or the Tarte website. I do see lots of listings on eBay and Amazon though! 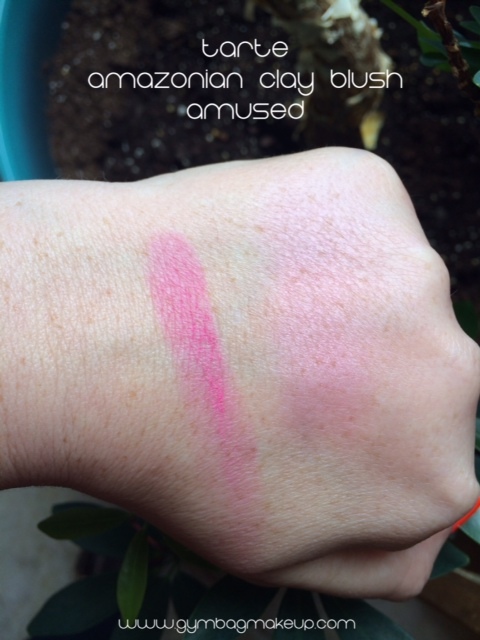 “Amused” is a matte blush but it does impart a slight glow. I’m not sure if that’s just an effect of this particular shade of pink or if it’s something in the formula, but this does have a very nice finish. Wear time: I don’t notice any fading throughout the day so I would say that Tarte’s claims hold true on this count. 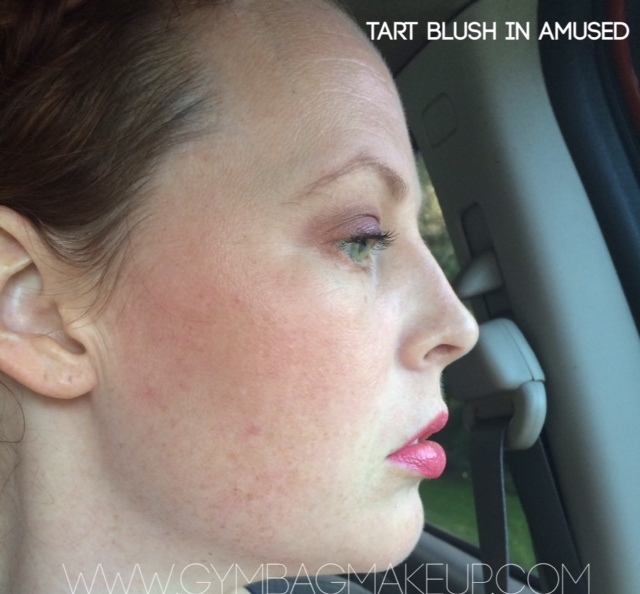 Texture: Tarte claims a “supremely soft” blush. The texture is smooth enough (although this is not one of those silky textured products) but it’s a tad hard bordering on chalk like. 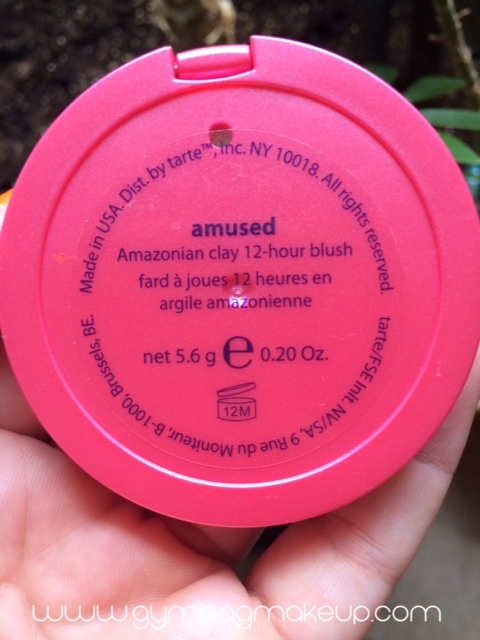 Shade Range: Amused is one of the brighter shades that Tarte has carried. There is a quite good selection of soft, neutral shades but even the bold shades in the line err on the side of natural/neutral. This isn’t a bad thing, but this line isn’t where you’re going to find something unique. What you will find is a good flattering shade for your skin tone. Other claims: Tarte also claims that the clay minimizes oil and hydrates the skin. Wait…what? Is that a thing? Can clay do that?! I mean, absorbing oil makes sense (although, I’m not sure that’s necessarily what I look for in a blush) but hydration? That seems quite far fetched. Of course, I’m not an expert so if this is a thing, and you know about it, fill me in! I like learning! Pricing and availability: $28.00 for .2oz. Tarte is sold at Ulta and Sephora or you can buy directly from the Tarte website. Again, “Amused” seems to be unavailable. Overall I like this blush but I don’t love it. Now we all know that a line can vary greatly in quality from shade to shade, so maybe there was a reason that Amused was discontinued. I wouldn’t mind trying another blush from Tarte but they aren’t particularly cheap and I just haven’t been wowed enough to spur me into purchasing anything else yet. Although…I do swatch Natural Beauty and Exposed whenever I’m in a Sephora. 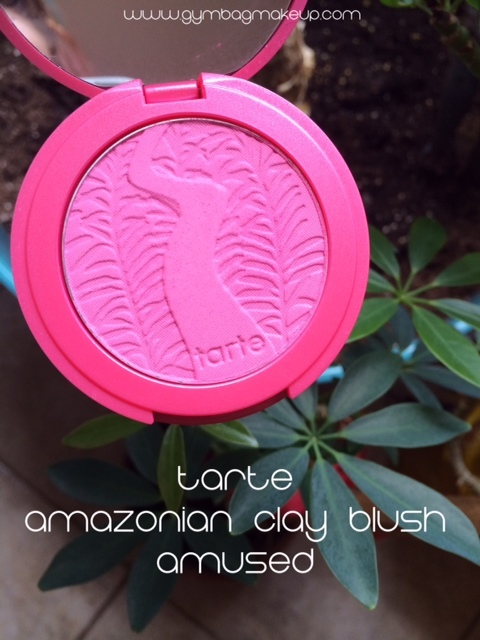 Do you have any of the Amazonian Clay blushes? What are your thoughts on them? Do you have this particular shade? I’d love to know if you think it’s similar to other shades in the line! 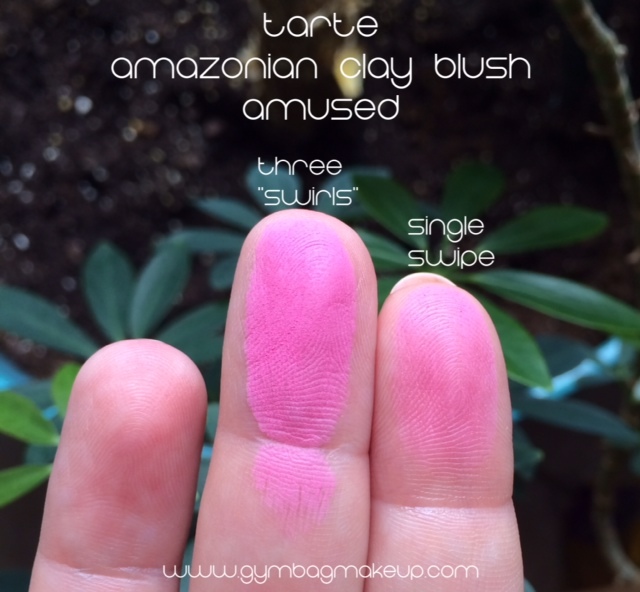 Do you think the whole Amazonian Clay thing is a little gimmicky? I have dollface and blissful. I love them both, but haven’t worn them recently since I got hooked on the Milani blushes. I’m still working on my first cuppa too so I probably wouldn’t quite comprehend it yet. I’m fascinated though! I’ll have too do some research. And because the Milani blushes are so much less expensive, you’ll have more money left to buy other makeup, haha! Haha! I feel that way about a few brands myself. I almost bought the holiday Tarte kit yesterday but managed to talk myself out of it.